LAST CHANCE! THEY’RE ALMOST GONE!!! 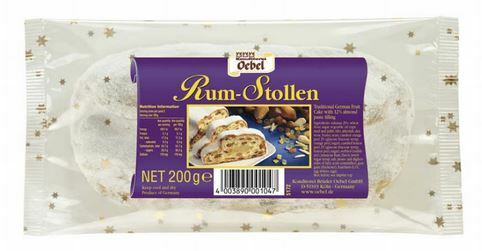 What would Christmas be without a ‘Stollen’? Baked with real Jamaican rum! Just right for the festive Season. Sultanas 28 %, wheat flour, palm oil, sugar, yeast, dextrose, candied orange peel 1.5 % ( orange peel glucose -fructose syrup, lemon peel 1.5 % (citron peel, (glucose -fructose syrup), sorbitol (stabilizer) Jamaica- Rum, 1 % vegetable oils (rapeseed and palm), natural flavor, salt, mono- and diglycerides of fatty acids (emulsifier); guar gum (thickener), wheat starch, hazelnuts 0.2 %, eggs, milk. This product may contain traces of almonds.